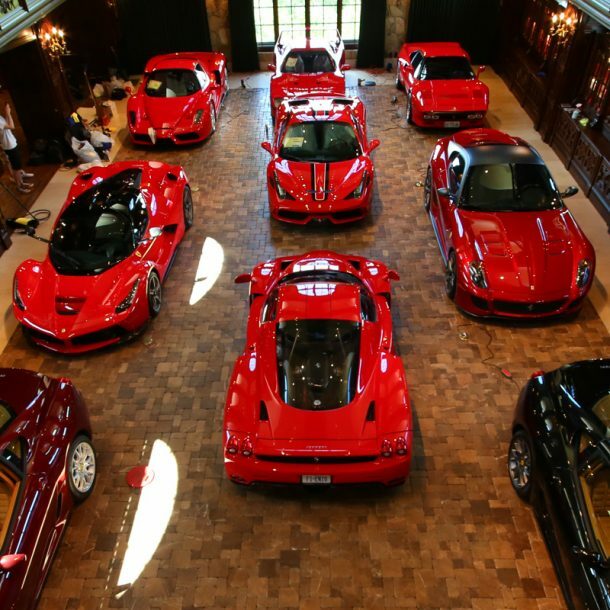 Ferraris and exotics are our specialty here at ESOTERIC, and our world-renowned services are second to none. Each vehicle from Ferrari, Lamborghini, Porsche, or any of the other high-end manufacturers have particular needs, and certain precautions need to be taken to ensure the safety of their surfaces. We have collected this knowledge and experience, and apply it to each tailored detail that we do on these rare and highly valuable exotic vehicles. At ESOTERIC, we are exotic detailing specialists first and foremost, and we happen to work on other brands…not the other way around! In addition to all of the detailing packages listed below, we highly recommend the addition of one of our Protective Coatings application! While the Single Stage Detail might be our entry level in terms of polishing/paint correction, it can make a tremendous difference in the overall look and color of the vehicle. As the name suggests, this level of paint correction utilizes just one stage of machine polishing (also referred to as one-step polishing). While not considered a “perfection detail” given the single stage process, a big transformation in the condition of the paint can be achieved. There are a lot of different variables that dictate just how much correction that you can safely achieve in a one-step process, and we approach each car and paint system accordingly to maximize results for the given budget or goals. There is no one system or product that works for all vehicles, and we are well-versed in all the modern polishes and techniques so that each vehicle can be tailored to accordingly. Full wheel and wheel-well detail (both dressed accordingly as well). We also use cleaners that are safe for delicate carbon rotors. When you step up to a Hybrid Detail, you’re combining heavier paint correction on the upper surfaces (where you see the direct sun reflection), with the lighter polish on the lower surfaces…hence the name “Hybrid”. At this level, the paint on the upper surfaces will see the removal of more than 90% of the swirls and scratches, and the color, depth, and gloss will be increased dramatically. The lower surfaces will typically see a 50% – 75% reduction of defects, and will also go through a significant change in gloss and clarity. Even as a mid-level detail, the finish quality is so good that you can pull up to just about any car show or Concours event, and your vehicle will most likely look better than anything else on the lawn. We have entered rare and valuable Ferraris in Concours events with the Hybrid Detail, and our vehicles looked far superior in every way. After being polished, we will apply either a very durable sealant or coating, or we will top it with a boutique carnauba wax. Application of either a durable polymer sealant or a premium carnauba wax is included (optional coating applications are available as well. Please see our Coatings page). With the Restorative Detail, you’re getting the absolute best of the best. The biggest difference between the Restorative and the Hybrid is the level of compounding and rate of paint correction. On the Restorative Detail, we will spend as much time polishing and correcting defects on the lower areas such as the rocker panels as we do on the hood. The ultimate goal on a Restorative Detail is to get all of the painted surfaces as close to perfect as is safely possible. During the polishing and correction process, we are literally stopping to inspect every square inch of paint with a high-intensity LED inspection light from just a few inches away from the surface to ensure that we are refining the paint to its highest potential. In addition to paint perfection and other basic detailing services provided at this level, we can also offer optional services for the restoration and preservation with rubber components, leather, or any other areas of the vehicle that may need help. Depending on the level of work to be done, these jobs can take anywhere from 3 or 4 days to several weeks. With vehicles like Ferrari F40’s, Enzo’s, 288 GTO’s, 275 GTB’s, and other rare / delicate models, the pricing is typically higher than other vehicles given their complexity. We have worked on more of these types of cars than most detailers have ever seen in person in a lifetime…we know exactly what to look for, and how to work on them to make them look their best, while at the same time preserving their history. Price is quoted after a full inspection is done on the vehicle. Please get in touch if you’d like to discuss options or projected price ranges. Given the condition of the paint on brand new exotics, my New Car Preparation for them is considerably different than what I do for daily driver vehicles. Given the hand-built nature of these cars, there’s a lot of opportunities for human error during the manufacturing and finishing processes. It’s fair to say that most brand new exotics come with paint in less than stellar condition, and it has been well documented within the highline detailing industry. Typically what you will find on these cars is either sanding marks leftover from their finishing process or heavy swirls marks and holograms caused by improper and aggressive buffing techniques (or a combination of sanding marks AND buffer trails). We have spent a tremendous amount of time refining these brand new vehicles, and we have services that will be tailored to each vehicles’ individual needs, and it will be done using the safest, responsible and most modern techniques available as paint preservation is always our top priority. Most of these vehicles require 15-25 hours worth of polishing to refine the finish, and we have seen some that go all the way up to 30-35 hours.